Get your little one to tap on his inner horticulturalist. Your child’s school holidays need not be filled with boredom or mindless video games. A hands-on activity like building a terrarium makes for great family fun and can inspire your child’s creativity. Whether you opt for an open or closed terrarium, keep in mind that all the plants in it should have the same environmental needs. 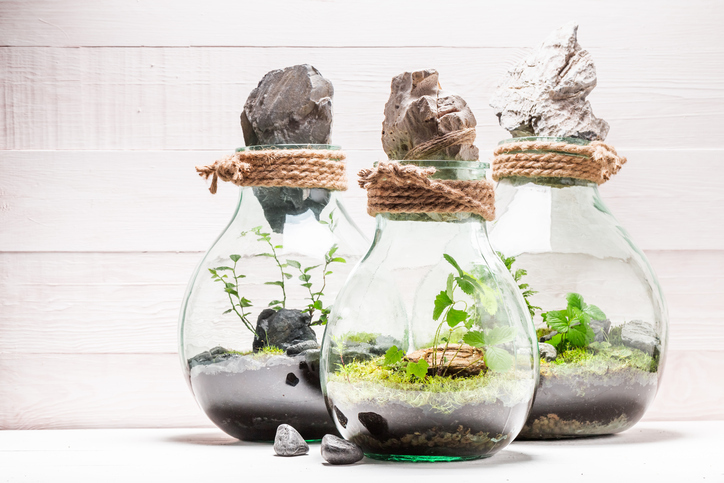 Open terrariums work best for sun-loving plants, but those that thrive in humidity, such as mosses, should be placed in a closed jar. Fill the bottom of your jar with rocks to collect water drainage. If yours is a closed terrarium, add a thin layer of crushed charcoal to keep the soil fresh. Pour a layer of sand over the rocks and charcoal. Add some soil, ensuring this layer is deep enough for your plants to root into. Together, the rocks, sand and soil should reach up to about one-third the height of your jar, with the soil layer being the thickest. Remove your plants from their containers and brush off any loose soil off the roots. You may want to trim some of the roots, depending on how long they are. Place your plants in the soil, beginning from the largest to the smallest. Create a hole in the soil, then nestle a plant in the hole. When you are done, pack some soil over the roots to hold the plant in place. Play around with the arrangement by mixing different types of plants. Be sure to leave some space for landscaping. Here comes the best part. Go wild with your landscaping by experimenting with everything from porcelain figurines and cake toppers, to agate slices or any other pretty trinkets! Clean excess soil off the glass inside the jar, then add a small amount of water. Enjoy your creation!